Now there are some special rado hyperchrome chronograph automatic watches are here to show. If you want beautiful and luxury swiss watches. Discover luxurious rado switzerland swiss watches here. Buy rado switzerland watches online. Stainless steel case with a stainless steel bracelet. Fixed stainless steel bezel with a rose gold (high-tech) ceramos top ring showing tachymeter markings. Grey dial with luminous rose gold-tone hands and index hour markers. Minute markers around the outer rim. Dial Type: Analog. Luminescent hands and markers. Date display at the 4 o'clock position. Chronograph - three sub-dials displaying: 60 second, 30 minute and 1/10th of a second. Rado calibre 312 quartz movement. Scratch resistant sapphire crystal. Pull / push crown. Solid case back. Round case shape. Case size: 44.9 mm. Case thickness: 11.7 mm. Band width: 21 mm. Fold over clasp with a push button release. Water resistant at 50 meters / 165 feet. Functions: chronograph, tachymeter, date, hour, minute, small second. Sport watch style. Watch label: Swiss Made. 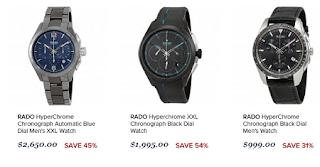 Rado HyperChrome Chronograph Grey Dial Mens Watch R32259163.